Valentine’s Day is all about the love, but whether you have a significant other or not, it’s the perfect day to celebrate loved ones in all forms. Everyone loves getting a little treat and reminder that they are adored and appreciated. With no shortage of V Day gift ideas out there, we are sharing some of the items and experiences on our own wish list! Whether you’ve been to the Met 100 times or can’t remember the last time you exposed your eyes to any visual art form, get inspired by this stunning book to explore amazing examples of art, from paintings to cave drawings to murals to sculpture parks, all found in the U.S. Want even more brownie points? Pair this book with some tickets for a getaway to experience one of these destinations IRL. Are you or your loved one hiding bling in unsightly boxes or tucking away your jewels in a jumbled mess in a drawer? A lacquered jewelry box will make organizing and highlighting your favorite pieces a cinch. Choose from a white exterior with eye-catching Kelly green velvet interior or fuchsia with a rich navy interior. Classy enough to leave out on your bathroom counter or vanity and portable enough to take with you on vacay. No matter what your décor style is, we always advocate for bringing nature into our interiors. 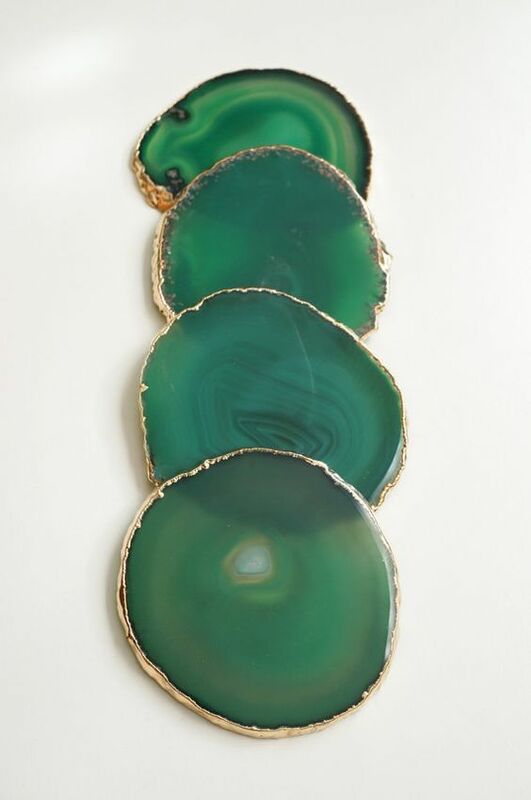 Agate bookends are a gorgeous way to display your favorite books and add instant organic beauty; we also like them on their own as sculptural elements. Dyed and polished to emphasize the naturally occurring ring patterns, these lovelies come in three different colors. 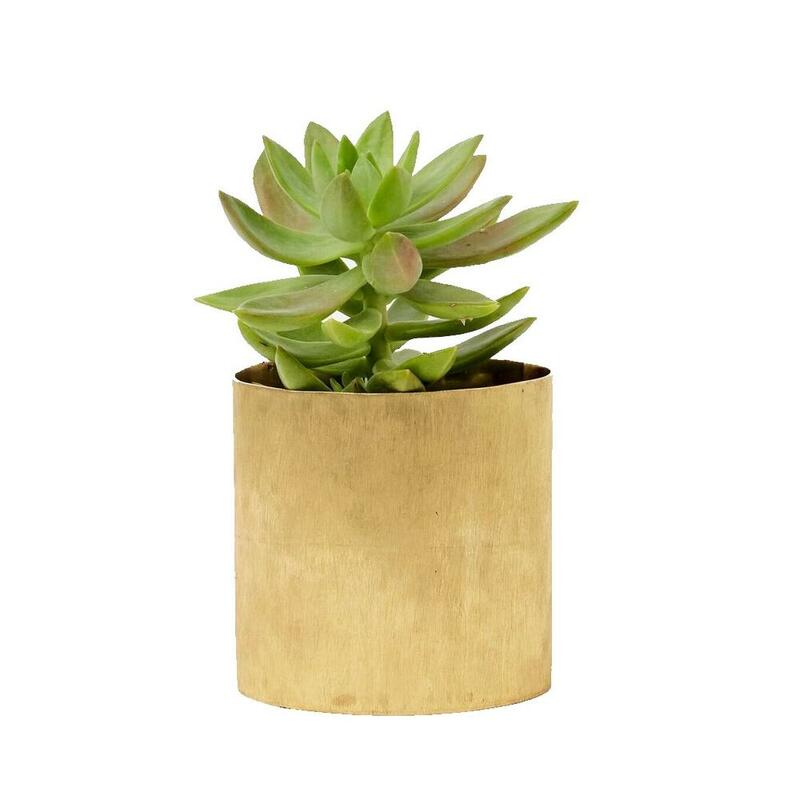 Fair trade, Eco friendly, woman made, handmade: this recycled brass planter, made in Kenya, checks off so many boxes in addition to being a simple way to add a little shine and glitz to your love’s desk or windowsill. Pot it with a succulent for a low-maintenance, long lasting plant that even the blackest thumb can manage. Anyone can grab some chocolates from the grocery store to surprise their sweetie, but these chocolates are next level charming and elegant. Made using sustainable sourced chocolate and painted by hand, Aurora Grace’s bonbons come in flavors like peanut butter salted pretzel, strawberry balsamic, and birthday cake and are almost too pretty to eat! Give the gift that keeps on giving: a private cooking class for two! Beyond being a fun date night that breaks the typical dinner-and-a-movie routine, you’ll be cultivating new skills that translate into delicious meals and snacks for years to come. Google your city’s options or try a service like Cozymeal that will pair you with top local chefs. Decorating with flowers and greenery is one of our favorite ways to change the mood and appearance of a home. The fall and winter holidays are an especially fun time to get creative by incorporating colors, textures, and scents that reflect the vibe of these annual festivities. Since we are not all born knowing how to make our home look IG-worthy or Pinterest-perfect with flowers, we tapped the brilliant brain of Richard Stone of The Faux Real Co. for some of his personal tricks, tips, and floral favorites. With Richard’s helpful hints, you will have gorgeous arrangements and decorations in no time, which means you can devote your energy to spending it with friends and family (and all that holiday food). Q: With the holidays approaching, what are some of the best ways to incorporate flowers and greenery into a longer-lasting decorating option? A: During the indoor winter months, heat can play havoc with fresh flowers and greenery. Stick with the tried-and-true like boxwood, eucalyptus, and magnolia, which will continue looking good when they start to dry out. Carnations unfortunately have a bad reputation, but they look beautiful when arranged in a mound or interspersed in a wreath or garland. A favorite holiday classic of mine is the Hypericum for a touch of color. Q: For people who don’t know a lot about flowers or design, it can be really intimidating to try and style an arrangement. Any simple solutions for beginners? A: When in doubt, I recommend hydrangeas, which can be arranged “en masse” for a beautiful bouquet. While I love their blooms, I usually arrange them in a container other than a glass vase to hide their erratic stems. Since one or two in the bunch will die, it’s a good idea to buy a few extra to have replacement stems on hand. Cut the base of the stem on an angle, and then clip a slit in the stem so they can drink plenty of water. Q: There’s nothing sadder than splurging on a bunch of flowers and then having them get all saggy and sad after a few days. What are your go-to flowers for when you want an affordable bouquet that won’t need to be tossed quickly? A: Hydrangeas, carnations, and lilies are excellent candidates for a longer lasting bouquet and are readily available. Steer clear of roses, ranunculus, anemones, and delphinium, which are very heat-sensitive and only typically last a few days. When creating a bouquet, it’s always important to make sure you’ve stripped off the lower leaves on the stems. These are what start to disintegrate in the water, and can create a mess, especially in a clear vase. Q: Some of our favorite bouquets and arrangements contain more than just florals and include fruits or vegetables (like romanesco or artichokes), succulents, or other types of ornamental grass. What are some of your favorite unexpected combinations? I remember a Christmas tree decorated at Keswick Hall with a garland made of fluffy miscanthus grass seed heads. At my favorite place on earth, The Inn at Little Washington, a pair of topiary made from dried corn greets guests at the door. If you’re using fruit in a wreath or garland, stick with smaller fruit like lemons, limes, and clementines, which aren’t as heavy and less likely to fall off. Use a floral pick with an attached wire to secure the fruit to your creation. 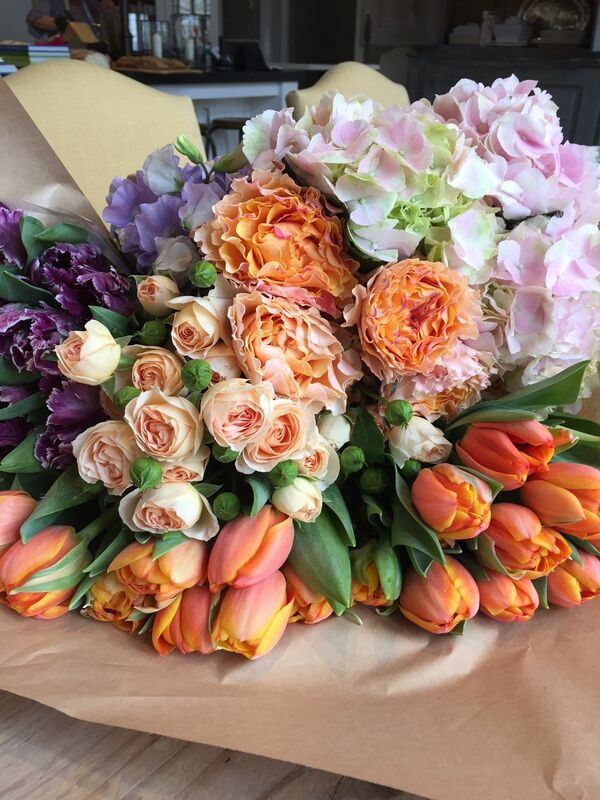 Q: Are there any new floral trends that have you especially excited? Or do you tend to stick to your favorite tried-and-true options? A: I love dried grasses and seedpods in an arrangement. I once made a fabulous pair of cotton boll topiary for a photo shoot, created with Styrofoam balls and hot glue. Okra pods are another favorite, which look wonderful in their dried form, or spray-painted gold. If you’re using dried grasses, such as the miscanthus garland à la Keswick Hall, give the heads a dusting of hair spray to keep them in place. Q: Are there any local/native-to-Virginia flowers that you use in arrangements? A: I love bittersweet. It can make a real mess when the yellow seedpods around the orange berries start to fall off, so I usually restrict this to outdoor use only. Osage oranges last an incredibly long time but are too heavy to use on a floral pick. Instead, try arranging the Osage oranges in a large bowl with a sprig of holly berries in between the fruits. Q: If you could only use one type of flower in arrangements for the rest of your life, what would it be? A: Peonies. If they’re cut while the buds are still tight, they will last for a week or two. When arranging peonies, allow enough room in the arrangement for their large blooms to open. Don’t pack them in too tight. We’re officially back from High Point Market (the largest home furnishings industry trade show in the world), and we’ve put together a list is the top trends we spotted in home decor! A unique and stylish way to display keepsakes, acrylic frames make a dramatic and surprisingly versatile statement. 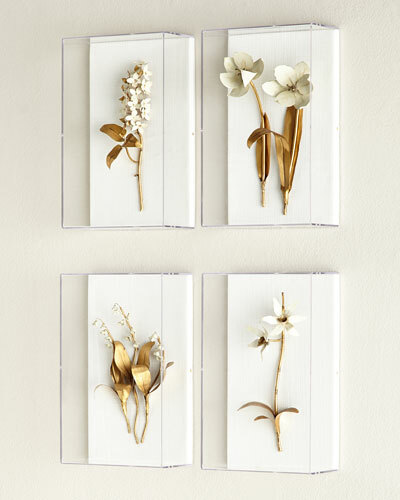 One large acrylic-framed piece of art can serve as a show stopping conversation piece, and we love it equally when this framing technique is used to showcase a series or set of smaller pieces, such as botanical prints or even more sculptural works. 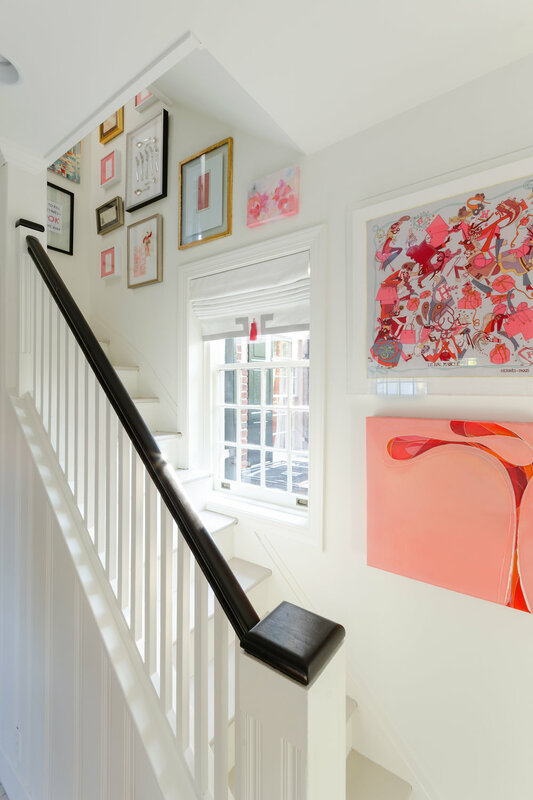 A clean and modern way to highlight art, acrylic frames can trend toward fresh and funky for an artsier, younger home or they can be dressed up for a more formal home. Without heavy and ornate frames, the space appears more airy and spacious and the art seems to “float” upon the wall. An easy and playful way to punch up a neutral couch or chair, geometric throw pillows in luscious materials such as mohair or velvet geometric add a bright spot (and some cushy comfort) to any room. In cut velvet or applique, they’re everywhere these days and no wonder: the combo of sumptuous textures, the huge variety of colors and patterns, and their evergreen functionality makes these pillows instant favorite purchases when tossed around your home. Occasional tables dutifully and quietly serve their purpose by holding any number of odds and ends, but the ones we spotted at High Point deserve some extra attention. Whether you go with a brass and natural agate table that will add instant glam to any space, a vividly patterned inlaid marble coffee table with a beautifully curved brass base, or a more minimalist and sleek drink table that features a brass top and a white marble base, these stand out tables have the power to transform a room into a hip, welcoming space. Maybe it’s this year’s long winter, but we’re craving luscious, vibrant green in our lives. Fortunately, we spotted plenty of emerald-hued items at the show to add richness and life to interiors. This saturated shade looks great on larger pieces of furniture, and it also makes a lovely accent color for details and home accessories. Gorgeous, handmade rugs never go out of style, but we fell for them hard during our High Point Market wanderings. Who could resist the craftsmanship, design, and sheer size of this stunner from Turkey? Handmade rugs are such a classic design element and true investment pieces that grow more beautiful as they age. In addition to serving underfoot in the typical areas of the home (such as dining, living, and bedrooms), we like to place them in unexpected spaces such as bathrooms and kitchens. Fell in love with this beauty from Turkey! Adding a pop of color and some subtle sheen, lacquered pendant lights are a fun alternative to the more typical metallic versions. As the color and shapes vary widely, the overall design effect is mutable: we found everything from diner chic options to a more geometric and modern style that would suit an office or even a design-forward playroom. Whether you live by the beach or not, chances are there’s an oceanside getaway that has your heart. To be reminded of your family’s times there, these designs are the answer and take the shell collection display up a notch or two. Coral, shells, and freshwater pearls make up a fantastic and striking chandelier-it looks like something that might hang in a mermaid’s palace! For a more subtle nod to gifts from the ocean, a variety of shells (including eye-catching turquoise limpets) are carefully and artistically arranged by hand to create a stunning mirror. You’ll smile each time you get a glimpse of your reflection framed by such natural beauty. As for this last shell display, it’s easily doable with whatever marine treasures you and yours have found. Confit pots have been used in France for several hundred years, and we’re regretting that we haven’t caught on to this trend sooner: French countryside chic never gets old. 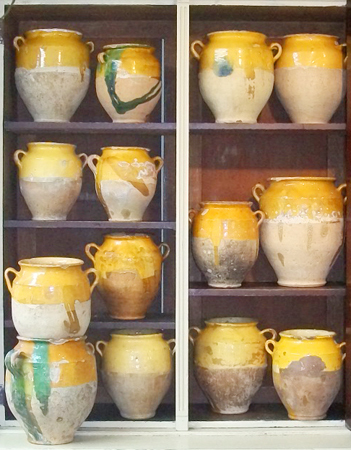 Functional as well as lovely on display, these typically two-toned vessels add a rustic yet refined appearance, especially to kitchens. The fact that, in a pinch, they can serve as containers to store small knickknacks left around the house? Genius, ma chérie. Decorating Goes Droolworthy: Pet-friendly bedding, feeding, and furniture solutions! In the United States alone, there are nearly 70 million pet pooches and almost 75 million kitty companions. We love sharing our homes with these adorable, loving, and loyal creatures, but sharing our homes with tacky and tasteless pet furniture? Not so much. Luckily, designers are finally taking into account that pet owners want furniture and accessories that seamlessly fit into our homes instead of sticking out like a sore thumb (err…paw). Dogs are notorious for finding the coziest spots in the house. Even if you don’t mind them staking their claim to a couch cushion or pillow, having a dog bed (or three) is a great way to encourage them to have their own resting space at floor level. Pet owners now have plentiful options for dog beds, from casual and simple to more ornate and posh (and perhaps even canopied). A dog bed in a vibrant hue offers a fun opportunity to bring a pop of color to the corner of a room. For those who count felines as their furry favorites, some kitty-friendly furniture options can even be DIYed. This woven basket was hung on its side with a soft, buttery yellow blanket folded up to serve as a de facto bed. Or try one of these craftsman-made lounging and sleeping options in miniature by Japanese designer Okawa Kagu. Or try one of these craftsman-made lounging and sleeping options in miniature by Japanese designer Okawa Kagu. Beyond where pets sleep, their feeding area of pets can be eyesores, not to mention the fact that to a little human crawling or toddling around, those food and water bowls look mighty enticing. Retractable bowls are a great solution: they slide out of sight when not needed and can be arranged to be the perfect, comfortable neck height for feeding fur babies. Keeping pet feeding essentials out of sight when not in use can be extended to other areas as well: a chest could be used for storing large bags of pet food, treats, and toys. In a client’s mudroom, a tall bibliotheque actually served as a dog kennel; we even drilled a hole in the side so the family’s cat could crawl in at night as well! Finally, one last necessity that tends to distract from a room’s design is a bulky, clumsy doggie or baby gate. Although these gates definitely serve a purpose for little ones with two or four legs, you can use a built-in dutch door or sliding door that fits within the style of your room. These gates are a great way for little ones to still see you, yet be safely contained in their own space. For most of us, our pets are truly members of the family. While they may not be as vocal about their aesthetic tastes, it’s now easier than ever to find bedding, feeding, and living solutions for them that are comfortable, stylish, and droolworthy in both the literal and figurative sense! In the fall of 2016, Sara Hillery Interior Design had the opportunity to partake in the Richmond Symphony Orchestra League’s biennial Designer House. The chosen house, a classic Georgian revival home located in historic Ginter Park, was designed by architect Courtenay S. Welton in 1929 and dubbed “Pineapple Acre”. SHID donated the time and materials for the project, which raises funds for the Richmond Symphony. The Pineapple Acre kitchen before remodel. SHID was tasked with transforming the kitchen, a dark, cramped, and non-descript space that didn’t reflect the owners’ playful and lively personalities. 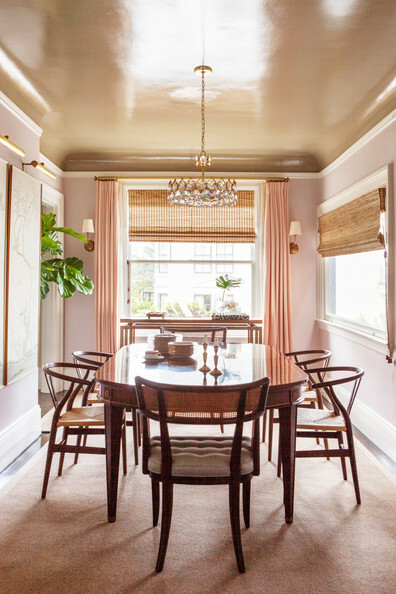 Dark wood cabinets, outdated wallpaper, and a lackluster color scheme hid the room’s potential as a gathering space for family and friends…until Sara Hillery Interior Design transformed the space. The SHID design team did a walk-through of the space in April 2016 before completing work on their plans. Demo started in June and the entire redesign was completed by the end of August with the help of Custom Kitchens, who respectfully preserved the bones of the kitchen while modernizing its appliances. Pineapple Acre, the 17th Richmond Symphony Orchestra League’s 17th Designer House since 1984, opened on September 12th to eager and curious visitors. The Pineapple Acre kitchen after remodel. The finished space bares little resemblance to its former dark and gloomy life with white cabinets, walls, tiles, and ceilings that capitalize on the room’s natural light and achieve an airy, spacious atmosphere. Pops of corals, pinks, and reds create a jovial and playful vibe that is simultaneously chic, welcoming, and utterly unique. Colorful details such as a bright pink octagon on the ceiling, custom cabinetry with matching interiors and accents colors, and tassels that contrast with color of the motorized window treatments create optical intrigue and draw the eyes to the room’s many points of intrigue. From the framed Hermes scarf that features a masquerade ball to a piece by local artist Ron Johnson to a tiered display area that pays homage to the family’s collection of 1929-era receipts and a coin, the kitchen is a veritable visual feast full of conversation-worthy art and decor…and that’s even before one realizes that the geometric-print bar stools have goat legs! The geometric designs in the room, combined with the warmth of carefully placed Eucalyptus wood elements, create a grounding effect that works beautifully amidst the room’s more spirited design components. Grey and white tiles frame the cooking zone, while a boldly colored rectangular rug contrasts with a repeating pattern of grey and white octagons and diamonds dancing unexpectedly across the floor. Bringing cheerful and vibrant details together with classic, orderly shapes and lines result in an artfully curated space that is sleek and crisp without being austere in any way. While designing a space that feels perpetually ready for a party or gathering, SHID took into careful consideration the serious business of preparing and cooking food. To that end, the kitchen includes state of the art appliances including a brushed stainless steel hood over an expansive Wolf range as well as plenty of drawers and ample cabinetry to store supplies, cookware, and ingredients. A marble top island increases counter space and handily hides a microwave. During the month-long Designer House showcase, hundreds of visitors were able to experience the transformed space. Now the home’s owners can look forward to many happy years cooking and entertaining in their lively, chic kitchen. Who wouldn’t want to spend all their time in this light-filled, well-equipped, and spirited space?